Ingredients: Meat broth, chicken liver, chicken, turkey, wheat gluten, meat by-products, calcium carbonate, natural flavor, starch, salt, sodium tripolyphosphate, potassium chloride, magnesium proteinate, zinc sulfate, iron sulfate, manganese sulfate, added color, xanthan gum, dl-methionine, choline chloride, vitamin E supplement, thiamine mononitrate, beta-carotene, pyridoxine hydrochloride, vitamin D3 supplement, folic acid, menadione sodium bisulfite complex, taurine, natural grilled flavor. Whiskas Grilled Cuts With Turkey In Gravy is formulated to meet the nutritional levels established by the AAFCO Cat Food Nutrient Profiles for adult cats and growing kittens. 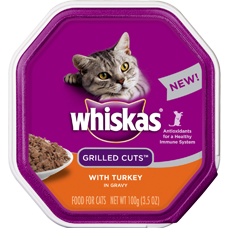 We'll begin this review of Whiskas Grilled Cuts With Turkey In Gravy with a detailed discussion of the ingredients. The first ingredient is meat broth. Meat broth provides both flavor and moisture; however, as with other broths, meat broth does not provide any notable nutritional contribution. In addition, we typically prefer the specific type of meat specified (lamb broth, beef broth, venison broth, etc), which is not done here. The second ingredient is chicken liver. Chicken liver is an excellent organ meat which provides high quality protein and fat. In addition, chicken liver provides many essential vitamins and minerals. The third ingredient is chicken, which provides animal-based protein and important omega-6 fatty acids. The fourth ingredient is turkey. Although turkey is an excellent protein source, raw turkey contains more than 60% moisture. After cooking, the relative meat contribution of turkey is dramatically reduced. Therefore, it's important to ensure that other meat sources are included within the first few ingredients to ensure the product derives most of its protein from meat. The fifth ingredient is wheat gluten. 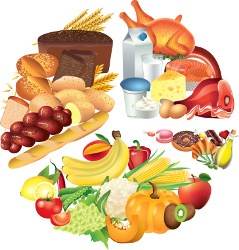 Wheat gluten is the main protein of wheat. Although wheat gluten is mostly protein, wheat gluten is considered controversial because it significantly boosts the protein content of the product. This is undesirable because plant based protein does not provide the same amino acid profile as meat based protein. Because ingredients are listed in order of pre-cooked weight, the remaining ingredients in Whiskas Grilled Cuts With Turkey In Gravy are not as important as the first five ingredients. Next we have meat by-products. By-products are defined by AAFCO as the "non-rendered, clean parts, other than meat, derived from slaughtered mammals." Thus, meat by-products contain nearly all parts of the animal which are typically not consumed by humans. These parts include the liver, lung, spleen, kidney, stomach, blood, intestine, bone, etc. Then we have natural flavor. The sole purpose of natural flavor is to improve palatability. Moving on, we have starch. Starch is a carbohydrate source. Unfortunately, the item from which the starch was extracted is not specified. Thus, we cannot make any specific claims on the nutritional value or intention behind the inclusion of this ingredient. The remaining ingredients in this Whiskas Grilled Cuts recipe are unlikely to affect the overall rating of the product. The official PawDiet rating for Whiskas Grilled Cuts With Turkey In Gravy is 2.0 out of 5.